The layout of the street course this year looked like a level right out of a Tony Hawk’s Pro Skater video game combined with the setting of the intro to Fully Flared. There was even a car parked in one of the garages. The girls flowed all over the course, weaved throughout the rooftops, did creative gaps and skated each part of the course. Despite Eliana Sosco’s great hardflips and Candy Jacobs’ perfect back feeble down the center 6 stair, consistency was key for a spot in the finals. 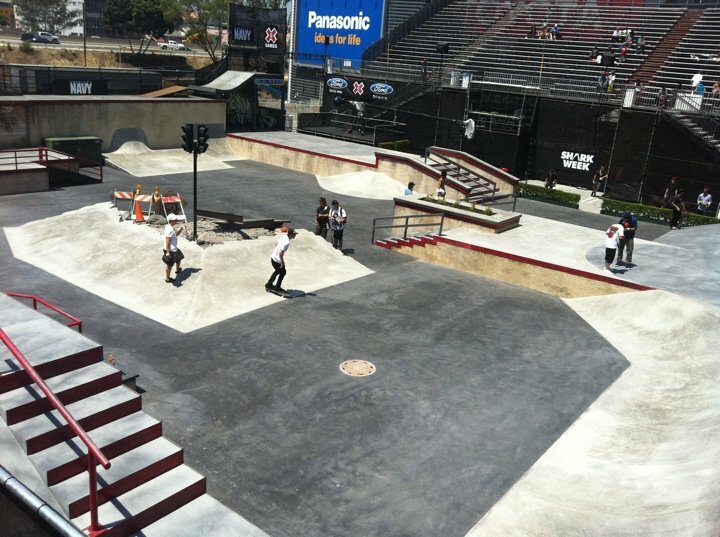 just a part of the street course, notice the skateable roof tops! Nineteen-year-old Jessica Florencio’s lines were smooth and consistent. She flowed around the park with Brazlilian super-powers, consistently hitting as many gaps as she could. She ollied the roof-to-roof gap, boardslid down the roof handrail, kickfliped into the euro, and was the only one to successfully hit the rail on the big 7 block with a couple of clean boardslides down the center rail. Veteran Elissa Steamer 5-0ed over the roof gap like the video game character she is, kickflipped into the euro, bs flipped to fakie over the hip. She did a fun gap and ollied off of the euro kicker and into the quarterpipe. Leticia Bufoni, another fueled by Brazilian super-power blood infused with acai berry, started her runs at the north west corner on the Bus Stop rooftop, ollied into the euro, then hit a big gap over the air to flat with a melon grab, then did bs 50-50s or crooked grinds across the roof gap, boardslid down the southeast handrail, frontside 180ed into the euro gap and had some of the snappiest clean lipslides down the handrail on the center stairs doing snappy lipslides down the center stairs, (unfortunately she didn’t go for any front feebles during the contest even though she got them in practice) She did do a couple of front 50 50s down the big hubba on the 7 block. Alexis Sablone, east-coast ivy league architect, was the only one to do flip tricks from roof-to-roof and started each of her runs by kickflipping the roof gap. She then would front board the handrail down towards the “ground level” of the coarse and popped perfect heelflips down the euro gap. She wasn’t as consistent in the finals but still 50-50ed the big section hubba and then pulled out perfect kickflip front 50-50s down the hubba out of nowhere, easily the biggest trick of the day. Immediately after, she cruised over to the other stairs and kickflipped them flawlessly. The buzzer meant nothing to Sablone, she wanted to make the big tricks for herself and kept trying even after time was up. She did some textbook front smiths down the center handrail during prelims, but didn’t get a chance to pull any out during finals. Marissa Dal Santo started her runs off with stylish roof-to-roof lipslides across the ledge then went straight into front boards down the hand rail and kickflips into the euro gap. She crooked grinded the handrail down the center stairs and also 50-50ed the big hubba and backside flipped up the euro gap to earn her winning run. She even pulled some kickflip melons up the euro during prelims.